Some people have said that I am one of the luckiest people they know. Maybe they are right, or maybe I am just always trying. As the commercial said "You can't win if you don't enter!" Today in the mail I got a priority envelope that wasn't squishy. It was rather packed and a bit ragged from the trip. Not that ragged, but a corner was torn slightly and it had clearly been handled a lot. Sigh, I didn't take a picture because I was too busy opening it after I saw the return address. Here is a stack on my sewing table from the package. 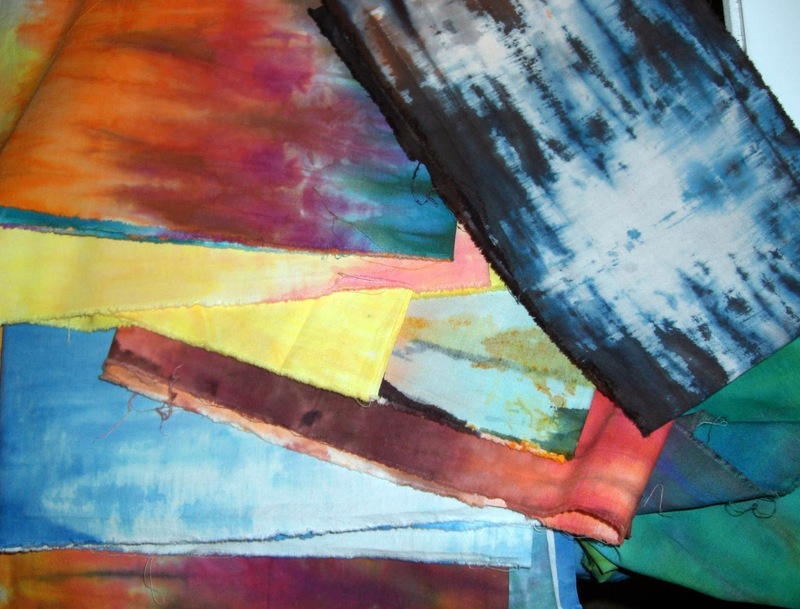 Now, I must confess that in the past I have had a hard time cutting into the hand dyed fabrics I have purchased. But since these are narrow pieces, I am finding it much easier - or maybe I am getting over my "hoarding" tendency. I took two of the pieces along with a shirt that had a worn collar and a small hole in it and started cutting. Having watched The Quilt Show last night with a segment where Tula Pink showed a "tubular method" of piecing, I had a plan. I used that method and made this piece of a quilt top. I am not sure where it will go or what it may become but I love it. I could not get the color to come out correctly but that background is blue pinpoint oxford cloth. It is essentially "the shirt off my back." But then it was in my 'discard' pile of shirts to be cut up and repurposed. I still have some pieces of the shirt left so I can possibly make another one of these pieces. This one is roughly 17 by 19 inches. I just realized that I somehow managed to line up two of the pieces exactly. That was not supposed to happen, but the second and third strip from the bottom are aligned perfectly. I did NOT measure or even try to align it. And I certainly didn't pin it. I am just shaking my head over this. If you happened to watch this episode of The Quilt Show, you will understand why. And in case you missed it - yes I am still sewing and making quilts! ha ha. And if you are wanting some amazing hand dyed fabrics for you own sewing pleasure - Vicki has them in her Etsy store- Vicki Welsh Hand Dyed Fabrics. Go ahead and treat yourself to some fun. Hi Gene. I've been busy with my daughter's room makeover and I haven't watched the latest Quilt Show episode yet. However, I am obligated (sort of) to watch because it also features Karen Marchetti, long-arm quilter. She lives in my neighborhood and actually, has my daughter's quilt that I made for her high school graduation. Karen has quilted others for me and she really does a wonderful job. You received some really nice hand-dyed fabric. Congratulations on yet, another win! Sweet. 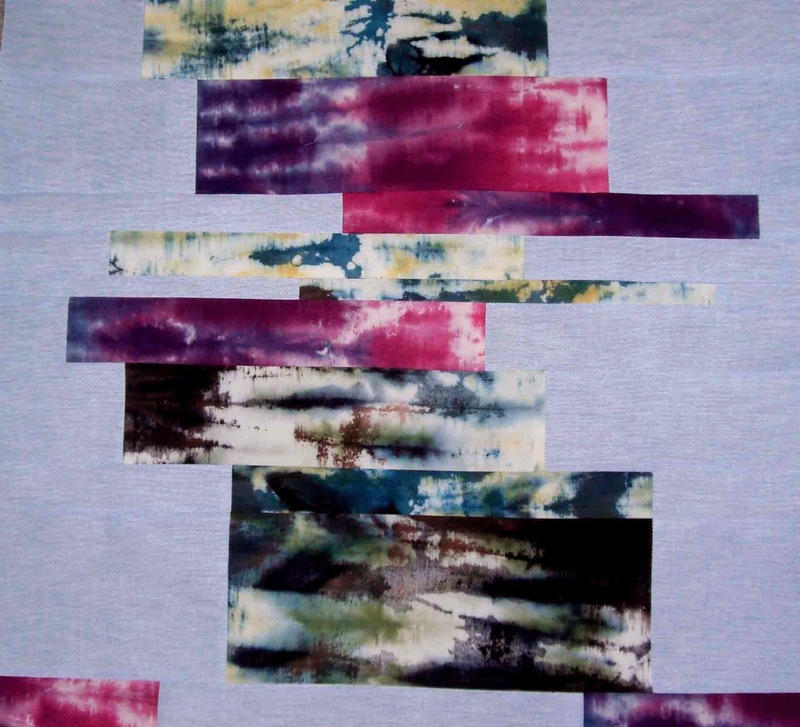 I just had some radiant orchid fabric made by Vicki for my Pantone Radiant Orchid quilt. She did a great job. What an awesome win...I so love those fabrics. Glad you are still quilting. Now you know I love this, no pattern! I don't think I can get that show but I can relate to creating in this random way. The colors are beautiful! I'm so glad you are having fun with them! Vickie's fabrics are beautiful! I say just use them in any which way and it will be fun and a surprise when you are finished. Easier said than done I know!!! I did not see the show. I lovbe your piece. The colors are so beautiful. I love that you are repurposing your old shirt too! Wow - that is some gorgeous fabric. I adore hand dyes. I'll have to check out her shop. Have a super day! Wow Gene....congratulations to you. What beautiful pieces you've won and then to jump right into a new project. I love the way it's coming together! !